This is the region of the thoracic cavity between the two pleural cavities. It is what is left after the lungs and the pleura have been removed from the thoracic cavity. 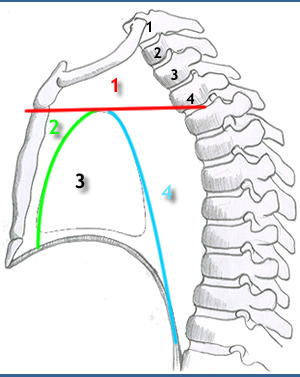 The mediastinum (a) extends from the superior thoracic inlet superiorly, to the thoracic diaphragm inferiorly . Thoracic vertebrae and their associated intervertebral discs and anterior longitudinal ligaments. 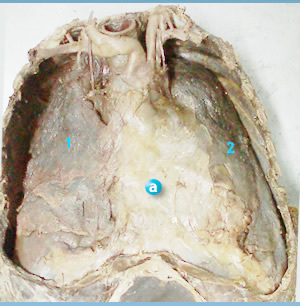 Laterally pleural cavities, containing the lungs. The root of the lungs connects the mediastinum to the lungs. These divisions are for descriptive purposes, merge into each other inpercleptibly. There are no distinct boundaries between them. In the neonate its very large extending from the thyroid gland to the pericardium.